it occurs to me frequently that while i have a list of where to access japanese prints, i do not have one, exactly, for their western counterparts. my reasoning is that i more often do mention them in calendar and commentary. which i'll continue to try to do more and more. was very possibly will bradley. bradley has been mentioned here a couple of times, and certainly deserves a post of his own, which will come. in the meantime, i've provided a link to more than you could possibly read at one sitting, so i have faith in your patience. on the right is a postcard, from japan--turn of the century. i haven't mentioned these before though because i wasn't sure how to place them, exactly. well, too bad. i still don't but they certainly deserve mention! there are so many wonderful ones. done during the meiji era's mixing of cross- cultural influences, this body of work, available online at boston's mfa, demonstrates just how crossed that cultural moment was. the cards illustrate everything from blonds in art nouveau settings to travel cards of locales around japan, from deco to ukiyo-e. it's hard to tell who the work was made for, the new tourists, for overseas sales, or for domestic, but they do make clear that the days of two radically separate cultures were definitely over. of the artist here, ichijo narumi, i could find nothing. don't miss magazineart.org (as i was just reminded by '100 years of illustration'), source of many years of wondrous magazine art. 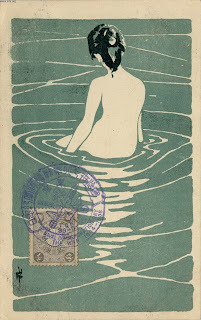 don't know the art style of "the bather" , can we call it Japanese Art Nouveau ? Images of women, in water that reflects moonlight, is appealing. The experience of that must be exquisitely beautiful.